We speech language pathologists (SLPs) work really hard. We put in long hours, manage billing, write evaluations and keep up with our continuing education. That’s reality. What I love most is seeing my students become confident. Whether it’s saying sounds correctly, successfully following oral directions, or writing a paragraph with proficiency, seeing them gain confidence brings me joy. I really love my little ones. These huggy, sweet, wiggly, sneezy, bright-eyed little people come to me struggling to communicate- and I get to have a hand in helping them join in the conversation- and watch them grow! I have many kids from age three through fourth grade….that’s seven years! They really become “yours”. I love the moment when a parent is able to hear their child truly communicate be it an independent request for preferred items or a statement of love. It doesn’t matter if the student verbally does it or uses AAC to communicate. It is that instant when both parties (parent & child) light up. I love facilitating that moment and sharing the power of communication. I love it when I can get my students to laugh. So many are very quiet and lack that zest about communication. Just today I had a manipulable caterpillar from The Very Hungry Caterpillar and I pretended it didn’t like the color yellow. The kids who I had in the group really don’t smile that often, but today just laughed themselves silly about that idea. I work with little ones (2 yrs – 6yrs). Often when they start they are very anxious and are not communicating very much (except for crying). I love watching their confidence grow as they become better and better communicators. I love watching their personalities come out from the super sweet kids who want to help their friends to the devilish ones who I know will make their teachers’ head spin in later years. The absolutely best part of my job is giving a voice to a student who has never been able to share what he thinks or feels. I’ve had adolescents tell me they are so happy to finally be able to ‘talk’ like everyone else, and littler ones who stop beating up themselves and everyone else. It’s the absolute best. I loved my job best when I was working with little ones, too. While it takes a lot of energy, there was such a wonderful feeling when they started to be able to use words or have their words understood. It is such a wonderful age to provide input and see tremendous growth. My favorite thing is when I forget about the paperwork and the deadlines and get to play in the floor with my students. It’s good to remember that students/clients are the reasons we do the job. My favorite thing about being an SLP is when my students come running into the speech room, ecstatic and proud, because they ‘said their good /r/ sound’, etc. It’s so fun to see how proud of themselves they are when they accomplish their speech goals. I love that I get hugs and high fives everyday. Kids are so real and authentic. I love hearing a previously nonverbal boy say “my turn” in context for the first time. I love hearing a student say “Hi Miss Anne” when he used to say “Hi Mits Aaa”. I love hearing a parent say “Thank you for helping my child.” Most of all, I love the feeling that the work that I do really matters. Such an amazing profession we share. It’s not all candy hearts and rainbows, but when we have an off day, it’s good to remember WHY we do what we do. P.S. Did you like this post? Go ahead and click on the links to see what else we’re doing when we’re not writing for Speech Spotlight. 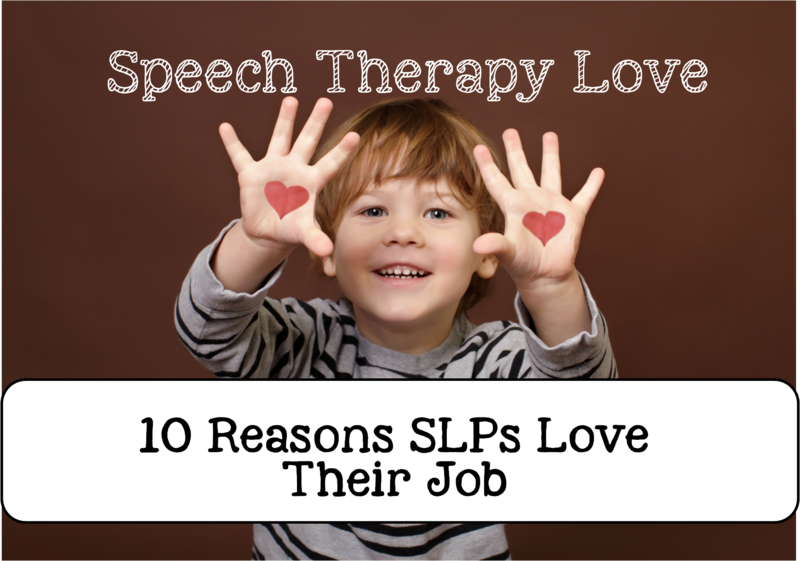 Comment below on what you love about being an SLP.